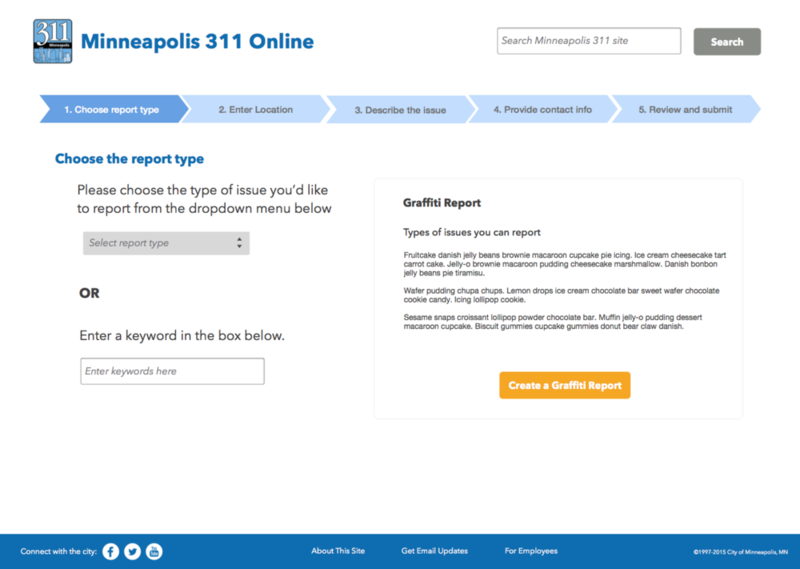 The Minneapolis 311 site allows users to submit reports for things like abandoned cars and graffiti on buildings. It needs to offer users a quick way to understand what reports they can submit and file these reports. There's a lot of information on the site, so it also needs to be clearly organized and presented. How can the site help users quickly get to the page they need? How can the city reduce drop-off as people are filing reports? The current information hierarchy makes downloading the app the most important thing on the homepage, at the expense of the primary user goals. The current homepage doesn't effectively target the second set of users who'd like to submit a request using the site. The search bar is difficult to find, and the fact that the "311 Online Services" is for submitting complaints isn't visually clear. The initial goal was to reduce the cognitive load trying to use the page. I used paper mockups to identify the most important information and work with some initial layout ideas. I used Sketch to create a high fidelity mockup of the homepage. The "Download the app" button is highlighted but more subtle. The color and positioning draw the user's eye to it without making it the most important thing on the page. The mobile version of the site focuses on supporting users who want to file a complaint, while also driving users to download the app. I also noticed that the process of filing a report had room for improvement. I created a user flow to nail down the steps a user submitting a request would need to take, and what screens she would see. The first page of the request asked for an email address, which will cause drop-off. Contact information should be requested at the end, after the user has filled out the report. The request process involves multiple pages, but there's no way to tell how many total pages there are. I used Sketch to redesign the workflow for filing a complaint.